Ericsson Mobility reports always make a fantastic reading. Its been a while since I wrote anything on this topic so I thought lets summarize it and also provide my personal analysis. Please feel free to disagree as this is just a blog post. Before we start, the official site for the report is here. You can jump directly to the PDF here. Ericsson will also be holding a webinar on this topic on 19 June, you can register here. A short summary of some of the highlights are in the table above but lets look at more in detail. The total number of mobile subscriptions was around 7.9 billion in Q1 2018. 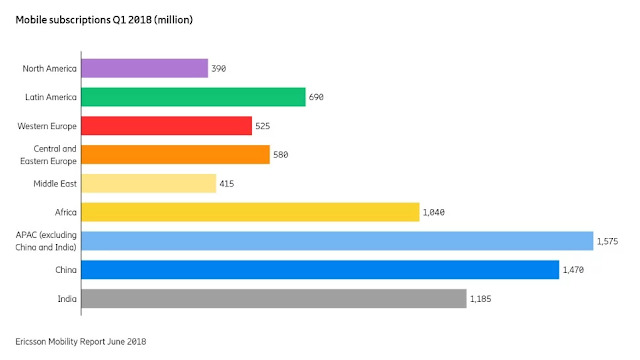 There are now 5.5 billion mobile broadband subscriptions. Global subscription penetration in Q1 2018 was 104 percent. The number of LTE subscriptions increased by 210 million during the quarter to reach a total of 2.9 billion. Over the same period, GSM/EDGE-only subscriptions declined by 90 million. Other technologies declined by around 32 million. Subscriptions associated with smartphones now account for around 60 percent of all mobile phone subscriptions. Many things to note above. There is still a big part of the world which is unconnected and most of the connectivity being talked about is population based coverage. While GSM/EDGE-only subscriptions are declining, many smartphone users are still camped on to GSM/EDGE for significant time. While smartphones are growing, feature phones are not far behind. Surprisingly, Reliance Jio has become a leader of 4G feature phones. My analysis from the developing world shows that many users are getting a GSM feature phone as a backup for when smartphone runs out of power. 1 billion 5G subscriptions for enhanced mobile broadband by the end of 2023, accounting for 12 percent of all mobile subscriptions. 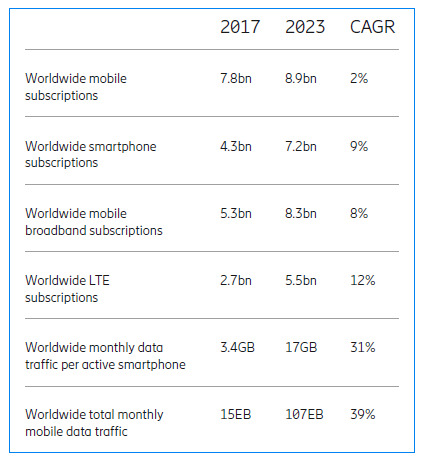 In 2023, there will be 8.9 billion mobile subscriptions, 8.3 billion mobile broadband subscriptions and 6.1 billion unique mobile subscribers. The number of smartphone subscriptions is forecast to reach 7.2 billion in 2023. The report describes "A 5G subscription is counted as such when associated with a device that supports NR as specified in 3GPP Release 15, connected to a 5G-enabled network." which is a good approach but does not talk about 5G availability. My old question (tweet below) on "How many 5G sites does an operator have to deploy so that they can say they have 5G?" is still waiting for an answer. Question: How many 5G sites does an operator have to deploy so that they can say they have 5G? 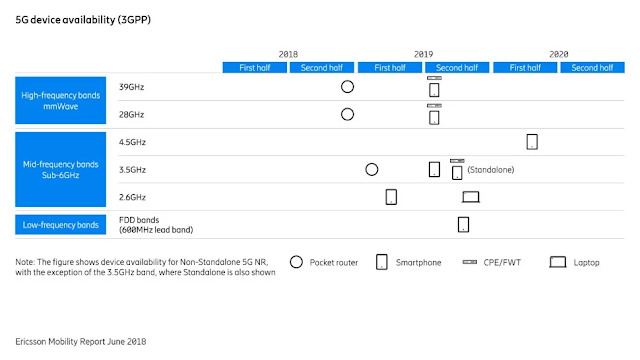 First 5G data-only devices are expected from the second half of 2018. The first 3GPP smartphones supporting 5G are expected in early 2019. From 2020, when third-generation chipsets will be introduced, large numbers of 5G devices are forecast. 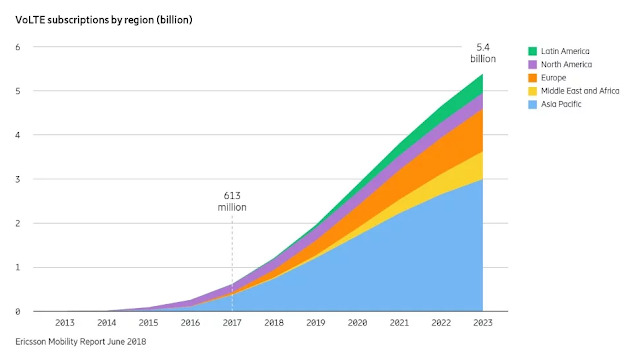 By 2023, 1 billion 5G devices for enhanced mobile broadband are expected to be connected worldwide. Qualcomm has made a good progress (video) on this front and there are already test modems available for 5G. I wont be surprised with the launch. It would remain to be seen what will be the price point and demand for these 5G data-only devices. The Register put it quite bluntly about guinea pigs here. I am also worried about the misleading 5G claims (see here). At the end of 2017, VoLTE subscriptions exceeded 610 million. 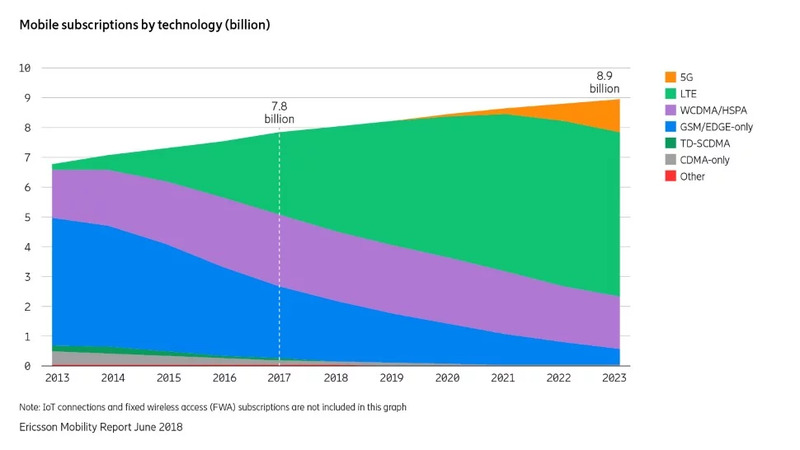 The number of VoLTE subscriptions is projected to reach 5.4 billion by the end of 2023. VoLTE technology will be the foundation for enabling 5G voice calls. New use cases in a 5G context are being explored, such as augmented reality (AR) and virtual reality (VR). Soon = before 2015. Ideally, if its working then never, until forced - RT @Gabeuk: I suspect VoLTE adoption will pick-up briskly in 2013. Looks like things haven't changed significantly. There are still many low end devices that do not support VoLTE and many operators dont support VoLTE on BYOD. VoLTE has been much harder than everyone imagined it to be. 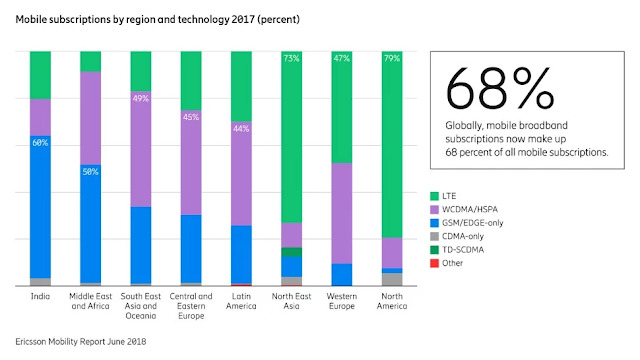 Globally, mobile broadband subscriptions now make up 68 percent of all mobile subscriptions. 5G subscriptions will be available in all regions in 2023. In 2023, 48 percent of subscriptions in North America and 34 percent in North East Asia are expected to be for 5G. I think that for some regions these predictions may be a bit optimistic. Many operators are struggling with finance and revenue, especially as the pricing going down due to intense competition. It would be interesting to see how these numbers hold up next year. While China has been added to North-East Asia, it may be a useful exercise to separate it. Similarly Middle East should be separated from Africa as the speed of change is going to be significantly different. In Q1 2018, mobile data traffic grew around 54 percent year-on-year. The quarter-on-quarter growth was around 11 percent. In 2023, 20 percent of mobile data traffic will be carried by 5G networks. North America has the highest monthly usage of mobile data per smartphone at 7.2 gigabytes (GB), anticipated to increase to 49GB in 2023. Total mobile data traffic is expected to increase by nearly eight times by the end of 2023. In 2023, 95 percent of total mobile data traffic is expected to be generated by smartphones, increasing from 85 percent today. North East Asia has the largest share of mobile data traffic – set to reach 25EB per month in 2023. This is one of the toughest areas of prediction as there are a large number of factors affecting this from pricing to devices and applications. 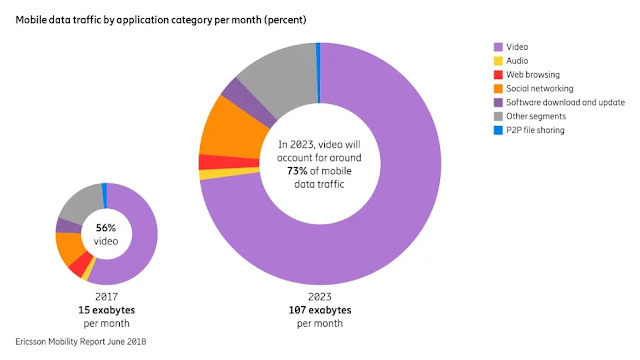 In 2023, video will account for around 73 percent of mobile data traffic. Traffic from social networking is also expected to rise – increasing by 31 percent annually over the next 6 years. The relative share of social networking traffic will decline over the same period, due to the stronger growth of video. Streaming videos in different resolutions can impact data traffic consumption to a high degree. Watching HD video (720p) rather than standard resolution video (480p) typically doubles the data traffic volume, while moving to full HD (1080p) doubles it yet again. Increased streaming of immersive video formats would also impact data traffic consumption. It would have been interesting if games were a separate category. Not sure if it has been lumped with Video/Audio or in Other segments. The number of cellular IoT connections is expected to reach 3.5 billion in 2023. This is almost double our last forecast, due to ongoing large-scale deployments in China. Of the 3.5 billion cellular IoT connections forecast for 2023, North East Asia is anticipated to account for 2.2 billion. 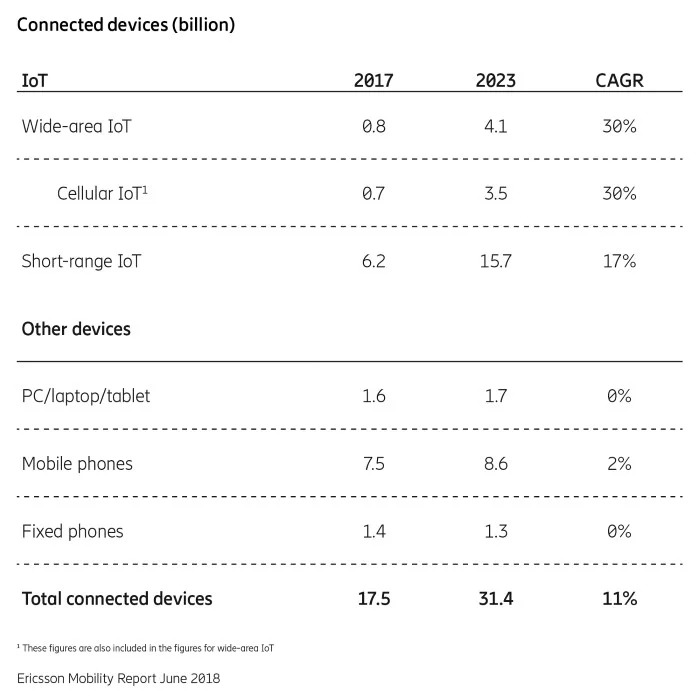 New massive cellular IoT technologies, such as NB-IoT and Cat-M1, are taking off and driving growth in the number of cellular IoT connections. Mobile operators have commercially launched more than 60 cellular IoT networks worldwide using Cat-M1 and NB-IoT. It is important to look at the following 2 definitions though. The Wide-area IoT in the table above includes cellular IoT. If you are a regular reader of this blog, you will know that I think LoRa has a bright future and my belief is that this report ignores some of the reasons behind the popularity of LoRa and its growth story. In 2023, more than 20 percent of the world’s population will be covered by 5G. 5G is expected to be deployed first in dense urban areas to support enhanced mobile broadband. Another early use case for 5G will be fixed wireless access. Today, 3GPP cellular networks cover around 95 percent of the world’s population. A lot of work needs to be done in this area to improve coverage in rural and remote locations. I will leave this post at this point. The report also contains details on Network Evolution, Network Performance, Smart Manufacturing, etc. You can read it from the report.